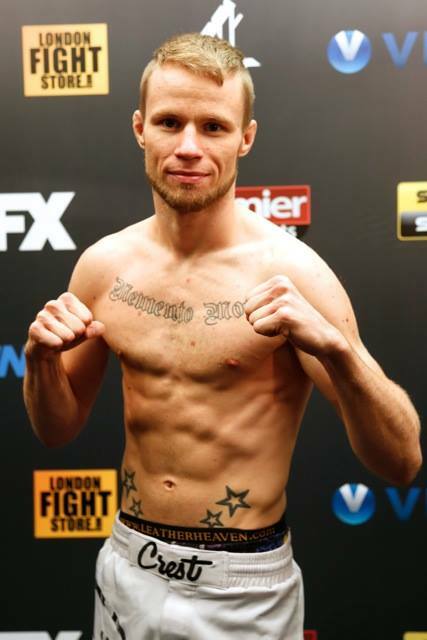 Tony Tauru will have a shot to become the first Finn to capture the Cage Warriors belt. Dynamite will take on UK’s Cory Tait for the vacant CWFC bantamweight world title. Tauru’s bout will be the last of the evening, since Nicolas Dalby’s title defense will not happen following the last minute pullout of Gael Grimaud. The only title fight of the night will follow UFC veteran’s Che Mill’s bout versus Jack Marshman, which is over! This is a 5 round main event bout. Toni Tauru looks relaxed as he comes into the cage first taking the blue corner, while Cory Tait reppin’ London comes in last in the red corner. Both lanky fighters are ready to make a name for them by winning the strap. There is no touch of the gloves, as Tauru with a big legkick to start and the Finn looks agressive on the feet. Tauru with a body lock and brings the fight to the ground, but the UK fighter reverses with Tauru looking for a knee bar but it is loose and they are up on the feet. Half way through the first round, and the East Front fighter looking for a take-down but he can’t get it. Tait using good kicks, but Tauru jumps in quickly to finish on the ground. On top with just under two minutes to work his submission game. In half guard, landing some short punches. Looking to pass guard, the Finn looking for some elbows, but nothing significant. Tait sweeps and looking for a guillotine, but Tuaru fights it off and is now safe on his back. Again, it is Tait trying to work the kicks, with Tauru closing the distance. The Finn with a body lock and some knees to the legs, but doesn’t seem to be able to lock his hands, and it is stopped and back to the center. Big right hand misses from the UK fighter but a knee lands, and the tide seems to be turning on the feet. A break in the action after an accidental kick from Tauru, and a couple good punches then a knee from Tauru in a rage of dynamite. Good elbow, and shot from Tauru then a HUGE straight right that drops Tait to his back, now Tauru climbs up in side mount looking for a submission, but nothing is there… but a good right hand before he slides into full guard. 30 seconds left, and it has been all Dynamite for the last minute. The UK fighter is cut on his cheek, and as the round starts it is Tauru unloading punches and landing with a good right and left combo and the Finn continues to throw bombs. The pace is high, and Tauru again jumps into a clinch. The two battle along the cage with short shots, and now the Finn takes it to the ground to take full mount and now side mount as the Finn takes total control of this round. A triangle attempt for Tait, and now an armbar but Tauru just lifts and power bombs his opponent to his back that releases all thought of a submission. Tait trying to land some elbows from the bottom as he pushes away the head. Championship rounds now for Tauru for the first time. Tauru looks confident now, marching down Tait. A big right hand that pushes Tait up against the cage and again the two are in the clinch. Another tie-up for Tauru, that just ragdolls the UK fighter to his back. Tauru now more agressive looking for damage, landing some decent elbows to the face as he locks down the arm and leg, and full mount and now moves to take back. Good elbow, and now the Finn looking for a RNC. Body triangle with 30 seconds left and he locks in the RNC and the end is near, and it is a tap. It is all over. Tauru celebrates by raising his hands and climbing the cage.